A winch is an integral part of a sailboat. Without a winch (or multiple winches), you are not getting out into the open waters and navigating to your destination. The price of winches is coming down, while the functionality, durability, and quality are all improving. If you need a sailboat winch, you will want the best sailboat winch. A winch will help you to raise the sail and also raise your anchor. These are both things which look to be straightforward, but if the winds get high to underwater currents rage, you can do some real damage to your equipment and boat if you do not have a winch which is built from high-quality materials and one which is built to do the job. With the correct winch, the ease at which you are able to sail is amazing. Geared winches will allow you to manipulate your sails in even the heaviest winds. Self-tailing winches will leave you with a free hand to use for other tasks. Electric winches will take the work out of the job completely. 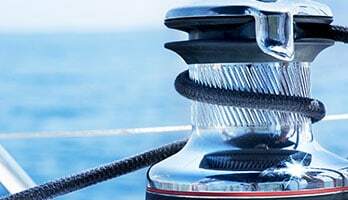 When choosing your winch, on a brand new boat or to replace a winch on an old boat, is a task which should not be taken lightly. We have scoured the choices and presented you with what we believe are the best out there. With these winches, you will not need to worry about them breaking down or having to replace them. 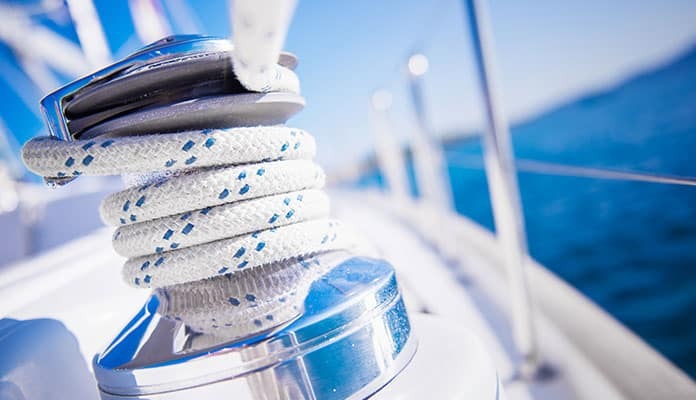 Here are our picks for the best sailboat winches in 2019. Lewmar has been making winches for a long time. One of their mottos is ‘evolution not revolution’. They believe in taking what they have and constantly improving on it. The EVO winch is no different. Drawing on their wealth of designed and manufacturing experience, the people at EVO have created a winch which may be the last you ever buy. This is one of the best sailboat winches out there. This winch is great for almost any craft. There are other sizes of EVO winch available should you wish to go bigger smaller, though we recommend this one as the perfect blend between size and power and one which will give you the functionality you need. We do not recommend going any smaller, but if you do have a very large sailboat, then a bigger option may be just what you need. This winch is easy to take care of. There is no servicing needed, meaning that you do not need to waste time, money, or space carrying tools around. The arrows on the winch also mean that it is great for when you bring new sailors aboard. They will have no problem knowing which way to crank the winch, and the possibility of damage or accidental strain will be lessened. This is also a winch which can be converted to electric should you want to take the work out of your own hands. The stainless steel feeder arm on the top of the unit also offers extra functionality and protection. No longer will you experience a rope trap above the jaws. The feeder arm steers the rope in the right direction and is fully adjustable to accommodate the rope which is coming from the jaws and heading to the cockpit. The EVO is the most advanced winch white Lewmar have ever made. They have taken their most popular winch, the ocean winch, and combined it with their years of knowledge to create the EVO. Being sailors and boat builders themselves, they know exactly what people look for in a winch. This is the result. This is a great winch for professional sailors, but also one which beginners will be able to use and enjoy. 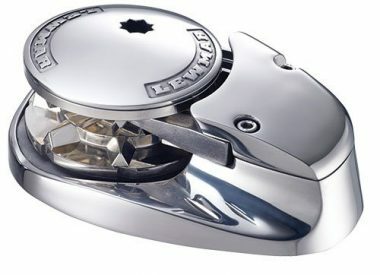 If you need a new winch for your boat or are just putting your boat together, then we recommend you take a look at what Lewmar has to offer. The EVO is definitely one of their flagship products and could the be the last and best sailboat winch you ever buy. Another option from Lewmar, and for good reason. They simply make the best sailboat winches. Let’s take a look at this winch from the inside out. The first thing you will notice is the stainless steel housing. I just hope that you can keep it as clean and shiny as it is when it comes out of the box. 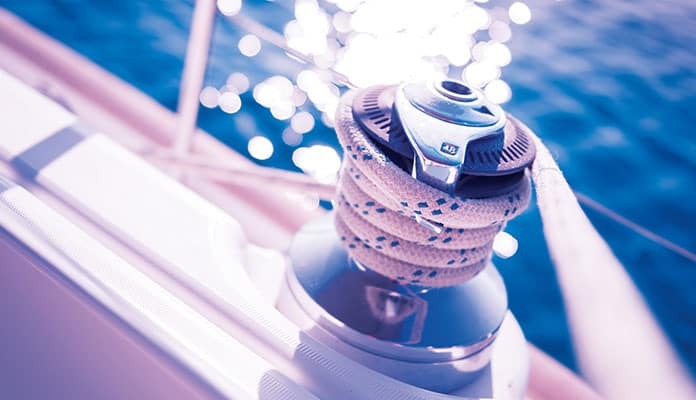 Of course, as a sailor, you will expect to have your boat and equipment take some wear and tear, but as long as you are taking care of the functionality, you do not need to keep this winch shining. The stainless steel will help to keep the motor running. Durable, it will last the test of time as you sail through any waters. The stainless steel also means that it will not rust, and the integrity of the body will not be compromised. We have to admit that it does look great. You will be hard-pressed not to give this a shine every so often and bring it back to its original glory. For this winch, you will want to have a 6mm or 7mm chain to feed the motor. The motor is durable, and it works quickly (make sure to use a pulley system so that your chain or rope does not rub against part of your boat). The minimalist nature of the motor means that there are fewer parts to break, and the simplicity of the motor means that the motor is more efficient and will not break down as quickly as some other winch motors. Do not be fooled; the minimalistic motor is a design choice. There is everything you need in there to be amazed by how good and efficient this product is. One of the features I love is the anchor lock. There is no danger of the anchor falling and yanking on the chain to damage the motor inside. This motor is also operated at the push of a button. Great for when you are in a situation which demands all of your attention and both of your hands. No need to worry about the winch simply hit the button and let it do its job. The casing is impact resistant. The motor inside will not be easily damaged, but if something does go wrong with the motor, there is a 5-year warranty included with the product. I would recommend this product for the person who does not want to or can not winch their own line. A great product for beginners and experts alike, and especially good for those who do not want to have to think about the winching. Press the button and you are done. Winches give you the leverage you need to manipulate your sails. When there are high winds, this can be particularly hard. This is where gears come in. The gears are what give you the extra leverage to be able to fight against winds which you would normally not be able to. Think about when you have been walking into a strong wind and how it has blown you back. Now, imagine that with a sail (material constructed to catch the wind). If you are going to be sailing into strong winds, or any winds at all, you are going to need a winch with gears. The same is true if you are using a winch to raise an anchor. Depending on the depth of the water, the currents, and the size of the anchor, you will need to have gears to aid you. You have two main options at your disposal: one-speed and two-speed. One-speed winches are cheaper. They give you leverage to manipulate your sails, but I would recommend them for smaller sailboats. When you turn the handle in one direction, there is one speed. What you see is what you get with this type of winch. Two-speed winches give you more control and more power over a sail especially. You crank the handle in one direction, and you get one speed (the faster speed). When you crank in the opposite direction, you get the second speed (the slower speed). This is great for when you need power. You can raise a sail quickly with fast speed, and then use the slower speed when you need to fight against the wind. Anodized aluminum is lightweight, and it is durable. It is also a cheaper option, making it a popular choice for sailboats. Stainless steel is one of the most durable materials you can use for a sailboat winch. You will pay a little more, but the longevity will pay that investment back. They look great. Chromed bronze is another material which is extremely durable. The chrome gives a modern look, not unlike stainless steel. Chromed bronze will cost a little, but it will also last for a long time. Composite materials are becoming more popular and easier to manufacture. They can be expensive, but you may never need to replace them. Sometimes you want some help on your sailboat. It can be hard work captaining a boat by yourself and taking care of everything without any help. Electric winches take the hard work out of operating a winch, and they provide a seamless and powerful service which is hard to replace by human labor. Most come with a button which can be pressed to activate. An electric winch will have more parts than a manual winch, and there is more of a chance that they will need to be repaired, but with advances in technology, electric winches are becoming more and more durable. The only downsides with electric winches are that they will typically cost you more and they need power to run. If you are unsure as to the size of winch that you need, you can find winch size charts on most winch manufactures websites or with a quick google check. Generally, the larger your boat, the more powerful a winch you will need. Q: How Many Winches Do You Need? A: A lot depends on how many winches you currently have and the condition of those winches. When it comes time to replace winches, you may do so for different reasons. After time, older winches will start to break down and will not work as they should. You may also want to replace older winches with self-tailing winches. If you are replacing all of the winches on your boat, then simply count the winches you have. If you have a sailboat with some rarely used winches, then you will not need to replace them all. Once you have replaced the winches on your boat with newer winches, you may never need to replace them again. Most small sailboats will only need between two and seven winches in total. Q: Do You Want Self-Tailing Winches? 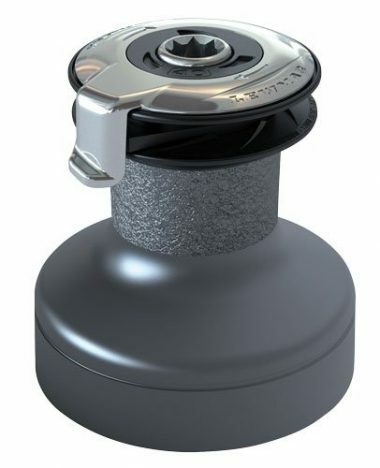 A: Self-tailing winches can be a great addition to your boat, no matter if you are sailing alone or with a large crew. When trimming a line on a sailboat, you will turn the winch while at the same time pulling on the loose end of the rope to maintain the tension. While this is not a difficult procedure, you will find that you are using both hands and have to complete the task without being able to do anything else at the same time. Self-tailing winches will allow you to operate the winch with only one hand, freeing up your other hand. On large boats with a large crew, you do not need to worry so much about this. One person can crank the winch while the other maintains the tension. I would recommend using self-tailing winches wherever you can (and wherever you can afford it). The benefit of being able to use the winch with one hand far outweighs the extra you may pay for the winch. Sailing is a pastime which is enjoyed the world over. Without a winch, you will literally be left high and dry. With the correct winch, you can make your sailing experience safe and enjoyable. There are many winches out there, but we have chosen the ones which will enhance your sailing experience. With an eye on safety and functionality, we want you to enjoy sailing as much as we do. Do you have one of our sailing winches? Tell us how they have worked for you in the comment section below.